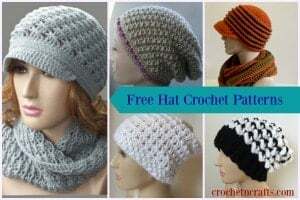 When sewing by hand it is a good idea to secure your thread at the beginning and end with a backstitch. This will secure the thread much better than a standard knot. The reason being is that knots can slip through the fabric, causing the seam to come apart. 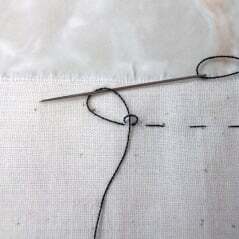 Whereas the backstitch secures the thread so that it doesn’t happen. To make the secure backstitch simply make a stitch on the wrong side of the fabric; pull the thread through until you have a small loop. 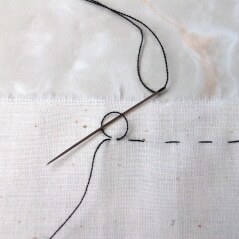 Insert your needle through the loop and pull thread through again until you have another small loop. Insert your needle through the second loop and pull tight to secure both loops. This is a quick and easy way to secure all sewing ends to keep the seams from coming apart.